Alan Kerr who has been the president of the society during the years 1998 and 2002 made the introductory speech on the History of the Politzer society. 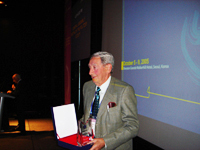 In his speech the evolution of the ear surgery and Adam Politzer’s modern contributions to it was also impressed. The meetings of the originators of close cavity technique has been turned to a corporate called as Politzer Society in 1970’s. Alan Kerr beautifully expressed the enthusiasm of the founders of Politzer Society. The keynote lecture was about “Otology tomorrow”. The molecular biologists are now the candidates of solving many controversial issues of otology and neurotology as in other disciplines. David Lim has beautifully described the new era that will conduct the otology within the remainder of this century. The symposium topics of the first day were secretory otitis media and idiopathic peripheric facial nerve palsy. There have been also round table discussions on otosclerosis, cholesteatoma, cochlear implantation and complications of chronic otitis media. The luncheon symposia organized by cochlear implant companies gathered the distinguished surgeons to display the latest applications which the technology brought to the hands of scientists, by also serving delicious lunches. Six papers were elected to be presented during the Meeting by the Prize committee, among the applications for Politzer Prize. These studies on basic and clinical research were competed with each other during the special session in second day. The best papers were then decided to be the owner of the prize. There have been three symposia during the second day of the meeting. 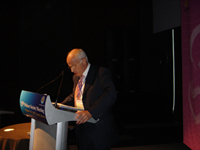 The symposium on reconstruction of the mastoidectomy cavities was moderated by O. Nuri Ozgirgin; management of congenital aural atresia was moderated by Per Bonding and benign tumors of the temporal bone were by Bernard Pauw. Management policies of vestibular schwannoma were discussed in the symposium moderated by David Moffat during the third day of the meeting. While the tendency to wait and scan policies is being popularized as mentioned by Jens Thomsen; the functional outcome of the tumor surgery by different approaches were reported by Emilio Garcia-Ibanez, Marcus Atlas, Richard Ramsden and Shigehisa Hashimoto. Treating the inner ear diseases by intratympanic perfusion round table that was moderated by Mohamed Hamid has also been one of the very interesting sessions of the meeting. During the last day of the meeting there have been 3 symposia on vertigo, rehabilitation of sensorineural hearing loss and neurofibromatosis II. The social part of the meeting was in competition with the Scientific program and the hospitality of Chong Sun Kim will stay in the minds of all attendants forever. The delicious Korean food has been coupled with the “Little Angels” performance within the prehistoric settlement site in Amsa-dong which is located at the edge of the Han River in Ganggdong-gu. Children’s traditional dances was lovely as it was conveying the attendants the peace-loving spirit of the Korean people and the beautiful culture and arts produced by the Country’s 5000 years of history and also represented the great turning point for the world in the new century. Also in the gala dinner the participants experienced the heart and Soul of the Korean life which has been one of the most memorable events of the meeting. Seoul meeting has also been a milestone for the Society and the presidency was switched from Mirko Tos to Jacques Magnan who has been the president-elect before. O. Nuri Ozgirgin took place of Professor Magnan as being the new president-elect. The terms of Alan Kerr as the past president, Makoto Sakai and Erwin Offeciers were ended whom we appreciate very much for their contribution to the Society as board members. The new members of the Board have been Hiroshi Moriyama, Roberto Filipo and Alec Fitzgerald O’Conner.